A quick & easy way to deliver concentrated doses of hydration & active ingredients into skin. Coony Essence Sheet Masks keep your skin clean, refreshed and hydrated. 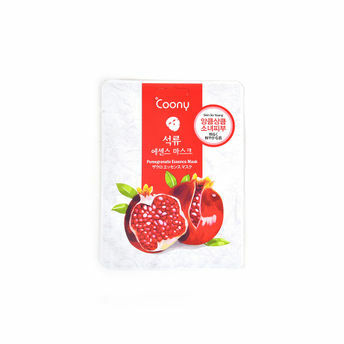 Coony Pomegranate Essence Mask is a brightening & nourishing facial sheet mask. It contains Pomegranate extract that is rich in estrogen for hydrating & brightening benefits. It is further blended with Aloe Vera Leaf Juice to calm & soothe skin irritation. After using this mask, skin appears softer, smoother, more elastic & younger looking. This mask is free of mineral oil, artificial pigment & fragrance.